Attention is drawn to Regulations 76 and 77 of the Safety, Health and Welfare at Work (Construction) Regulations 1995. These notes are a brief summary of safety precautions based on the 1995 Regulations made under the Safety, Health and Welfare at Work Act 1989. It is the responsibility of employers, employees, and the self-employed, to ensure that legal requirements are complied with. Particular attention is drawn to the Safety, Health and Welfare at Work (Construction) Regulations 1995 and other legislation setting out the duties of owners, employers and employees in relation to the construction and maintenance of buildings. Above notes are given for general information guidance only, and are not to be taken as comprehensive. All Condron Concrete Works Drivers have Hard Hats, Steel – Toe Boots, Safety Jackets and current FAS Safety Passes. Use of concrete pipes should be in accordance with the relevant National and European Union Codes of Practice. Tidy up debris from broken pipes. Concrete pipes may be recycled or placed in approved landfill sites. Concrete pipes have no ecological effects. 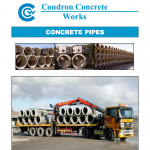 Concrete pipes are a mixture of natural aggregates, cement, water and steel. Admixtures may be added to modify the properties of the finished product. Protect skin when handling concrete pipes. Use suitable handling and transport equipment when using concrete pipes. Before lifting always size up the load. Always follow safe lifting and manual handling procedures. Ensure adequate load bearing capacity of the ground when placing or storing concrete pipes. Recommended stacking heights depending on diameter. Pipes in storage should be chocked. Do not roll / drag pipes. Webbed fabric slings or `C’ hooks should be used. Trench preparation and pipe support should be in accordance with Health and Safety regulations. Store / Stack well back from edge of any excavation. Concrete pipes are grey in colour. Concrete pipes should be stored correctly to prevent rolling and overturning. Cutting, drilling or hammering of concrete pipes can create dust. If inhaled in excessive quantities over extended periods, respirable dust can constitute a long term hazard Cutting, drilling or hammering of concrete pipes, unless adequately controlled, can project particles at high velocity with consequent risk of impact damage and/or injury particularly to the exposed areas of the body and eyes. When cutting, use equipment suitable for concrete and steel in accordance with manufacturers instructions. Wear goggles to prevent eye contact from flying particles when cutting, drilling or hammering concrete pipes. Wear appropriate respiratory protection when cutting, drilling or hammering concrete pipes. Wear footwear with protective toecaps when working with concrete pipes. Ensure the integrity and stability of pipes whilst stored on site.